The Bristol BD-16 by Blueridge is a lower end guitar that aims to offer higher end quality features at an affordable price. With higher quality craftsmanship, the type of which can only be offered by a smaller company, this is an instrument that will allow those with smaller gear budgets to get a longer lasting, better sounding instrument. The Bristol D-16 is a very well built guitar. The 7 ply body binding lends it a sturdy, strong feel, absent in most guitars of its class. For a lower budget guitar, it is very finely crafted. The mahogany is surprisingly good–while it isn’t the prime choice wood that higher end guitars use, it is still resonant and it still has a solid, smooth feel to it. The guitar is also deceivingly light for a dreadnought; it weighs about 3/4 as much as other guitars its size, and with the lighter weight, it still maintains its sound feel, which says a lot for the build quality. Finish is where the Bristol BD-16 stumbles in its stride. With such a large guitar, high gloss finishes are usually a bad choice due to their tendency to cause slippage if sweat is involved. If you are going to be playing the BD-16 for an extended period of time, be prepared to adjust the guitar frequently to keep it well positioned. The action on the Bristol BD-16 is excellent, not just for a manufactured guitar, but for a guitar in general. It is extremely consistent, not too high or too low, and there was no fret buzz at all. The intonation was actually good, which is something uncommon for guitar taken straight out of the box. But where this guitar truly shines is with the feel of it. Despite the high gloss finish making for a tricky playing situation at times, the BD-16 has an impressively comfortable feel. The neck is very smooth, and the guitar itself feels extremely solid overall. It is the type of instrument that you can sit down and play and immediately feel at home with, which is remarkable at its price point. At its price range, this Bristol has an uncommonly beautiful tone. Almost everything on this guitar aligns perfectly–the intonation, the action, the wood choice–to lend it an absolutely wonderful tone. 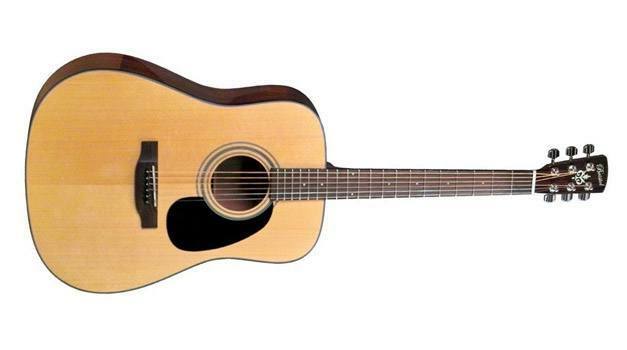 On sound alone, this guitar can easily be classed with instruments in double its price range. The notes ring clear, chords have substance and power, and harmonics resonate sweetly. If there is one quality of the Bristol BD-16 that reigns supreme, it is its tone.